As part of mt PGCE course I had to create an ICT resource to teach some element of the Maths Curriculum. In which the authors tried to present a novel approach to the Maximum area problem for a given length of fencing. Using this as a guide I decided to design a similar approach to tackle to Max Box Problem. I decided as I had gone to the trouble of putting it all together I may as well share the resource with other people who may find it helpful. To make the algebra a little easier I finally altered the essay to use squares of paper which where 20cm by 20cm. If you find this useful or have any ideas on how I could improve this then drop me a comment! I am glad you find the article (The power of EXCEL) I co-authored with Wu Yingkang interesting and also happy to see how it has helped you create an ICT resource for your PGCE course. I have given something similar to what you have created to prospective teachers before and if you would email me at the address above, I could suggest some ideas on how you could improve on this ICT resource. Finally, congratulations to you and Ruth on becoming parents-to-be soon. Thank to all of you who raised "The Power of Excel" by Chua Boon-Liang and WU Yingkang. 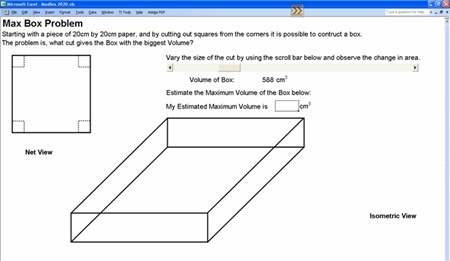 I did find the article extremely useful and helped me as teacher of mathematics (NQT) to look at it as an ICT lesson rather than algebraic calculations to find the volume using equations. I am glade I have a copy of Micro Math Vol 20/3 Autumn 2004. the is a review of max box by Kate Mackrell using Cabri 2+.